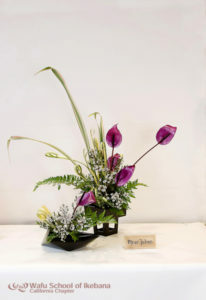 Simply stated, Ikebana is the Japanese art of floral arranging. The word ikebana “生花” means live flowers or the living spirit of flora. Ikebana originated about 1500 years ago as offering flowers on the Buddhist altar. It was highly symbolic and done exclusively by Buddhist priests. Over the centuries, ikebana evolved from formal altar arrangements into a cultural art form practiced by the samurai, using specific rules regarding composition and the combination of materials. By the late 19th century, all Japanese people practiced ikebana as a domestic art. For the Japanese, ikebana was more than simply displaying flowers in a vase. Like the tea ceremony, ikebana is a disciplined art form that involves creating an inner accord with the world. For the artist and viewer alike, it is an opportunity for contemplation and for achieving a deeper closeness with nature. 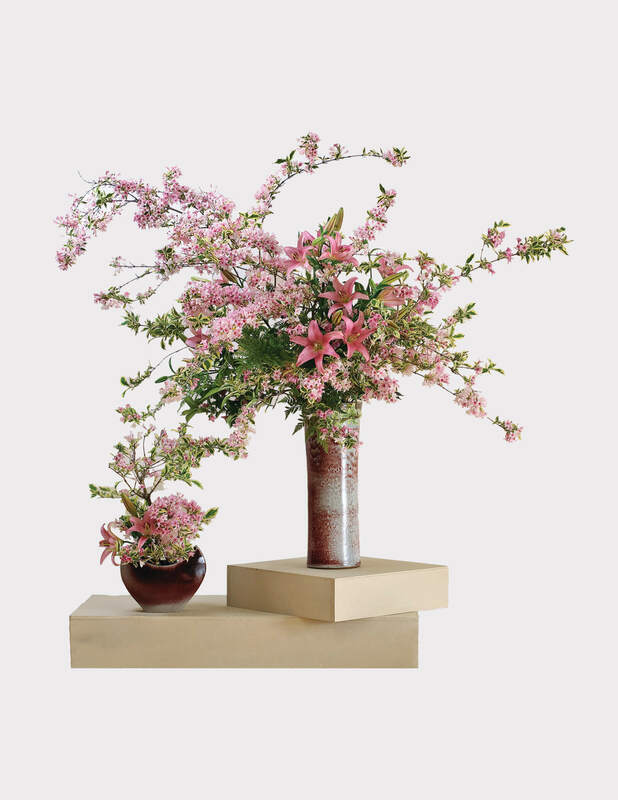 Like any art form, ikebana has evolved and has been shaped by world history. Today there are ikebana artists around the globe, and there are over 3000 different schools of ikebana. They include both classical and modern styles and each style is called a ‘school’ of ikebana. The art of ikebana is in the way the stems, the leaves and flowers are arranged in vases creating beauty comprised of color combinations, graceful lines, and the overall form of the arrangement. These are called the techniques of ikebana; these techniques are what people attend ikebana classes to learn. Regardless of the school, there are common philosophical threads that tie all ikebana arrangements together. An ikebana arrangement is asymmetrical and deliberately uses space as an essential feature of the composition. The artist also strives to create a sense of harmony between the materials used and the container. Today’s ikebana is a dynamic, world-encompassing art form that incorporates the color schemes, flowers, and vases of all countries and cultures. The Wafu School was founded in 1896, during the Meiji era by Wafu Teshigahara. It was originally named the Japan Ikebana Academy. In 1946 the second generation headmaster, the father of the current headmaster, introduced a more relaxed and individualistic style of ikebana, which was suitable for display in the home. 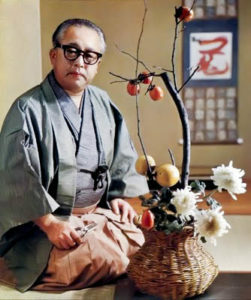 He promoted his unique philosophy of ikebana art throughout Japan, the United States, Europe, China and South America. He was tireless in performing demonstrations around the world, which exemplified his deeply felt belief that through the art of ikebana individuals could find peace and understanding. And if individuals understood each other, he believed, then nations as well could have harmony between them. This philosophy permeated all of Mr. Wafu’s demonstrations, including those at such prestigious organizations as the United Nations. Since 1992, the third Wafu Teshigahara has continued his two predecessors’ international work. The current headmaster is the third generation of the Wafu family to lead this school. Born in 1949 in Kamakura, Japan, his ikebana artistry is enhanced by his talents in photography and graphic design. Headmaster Teshigahara actively supports the artistic development of chapter members worldwide through regular visits to chapters in Japan and abroad to conduct study sessions and give lectures. Since 1967, the Wafu School of Ikebana has been certified a Juridical Foundation by the government of Japan’s Ministry of Education, being one of only four ikebana schools to earn this official recognition (Ikenobo, Ohara, Sogetsu and Wafu). The Wafu School's future, when the headmaster's daughter will lead the school, is already being prepared. 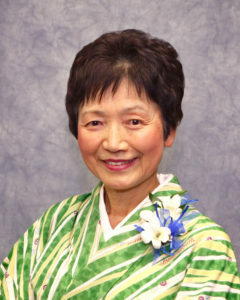 Mitsui Teshigahara was officially named Assistant Headmistress of the school in 2003. Headmaster Wafu’s educational efforts are being reinforced by the participation of his daughter. As a father–daughter team, they foster enthusiasm for the unique beauty of Wafu ikebana. The nonprofit Wafu Ikebana Society is the official name of the California chapter of the Wafu School of Ikebana. The Wafu School of Ikebana has chapters throughout Japan and in many major countries, including the United States. Today, one of the school’s most active chapters is in California. In 1971, a protégé of the second-generation headmaster, Fusako Seiga Hoyrup, established the California chapter of the Wafu School of Ikebana. Under her enthusiastic and tireless leadership, the chapter today has more than 200 members and several active instructors bringing the exquisite beauty of Wafu ikebana to the San Francisco Bay Area. The society’s multicultural membership, reflecting California’s diverse populace, is bound together by a common interest in and appreciation for the art of ikebana. Chapter activities include instructional courses, demonstrations and the chapter's popular biennial flower shows in Silicon Valley, which attract thousands of visitors. Chapter members also participate in the activities of Ikebana International's Bay Area Chapter and the Ikebana Teacher’s Federation to help promote appreciation of ikebana and to bridge cultures of the world.